Yes, most of us have a smartphone now and Google/Apple Maps can be great in a pinch, but they are nowhere near as effective for navigation as a standalone unit. Some may disagree, but our preference for navigation on a bike (particularly if you go anywhere near the dirt) is a GPS, with the backup of a local map. Just like any other motorcycle component, most GPS units are specialised for specific purposes. Models that are good for doing multi-state rides might not have all the features you’d want when for dirt tracks in mountains. Before purchasing one consider where and how you’re going to use it so you end up with a unit that best suits your needs. 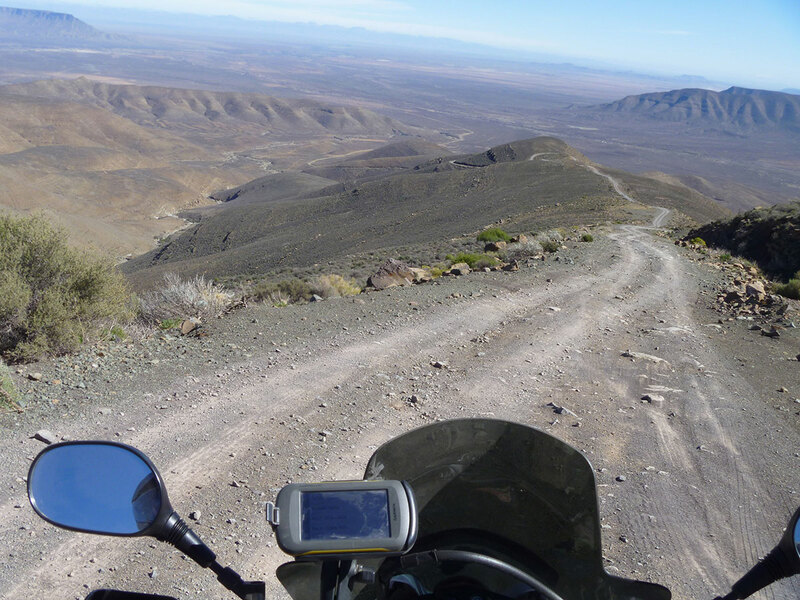 If most of your motorcycle adventures will take place on highways and paved roads your motorcycle GPS unit should be geared towards ease of use. Unlike with dirt riding, you probably won’t want to stop to look at the unit, and thus it should be easy to read and have a display that’s not too cluttered. Additionally, some models that are designed for city use include traffic data that will help you avoid sitting in gridlock. While a dual sport bike can go on pavement, most of your time will be spent riding forest service and fire roads – dirt track where it’s not uncommon for you to take a few spills. As such, your motorcycle GPS needs to be rock solid in the durability department, and preferably quite waterproof in case you lose your balance crossing a creek. As for features, you’ll want to look for a model that has easy to download maps, because the ones that come with it may not be detailed enough for the remote regions you’ll be riding in. As adventure touring encompasses all of the above types of terrain, you’ll need to find a GPS unit that can do it all and do it all fairly well. Therefore, you’ll probably need to make some compromises based on whether you spend more time on the open road or a dirt track. As above, if most of your adventures take place on the pavement, be sure it’s an easy to use unit that won’t result in a lot fumbling around as cars fly by you. If you prefer your weekends in the dirt, be sure it can take a few licks and keep on ticking. These are some of the best GPS units you could ride with, but each has their pros and cons. Consider how the features of each model, and the problems they have, fits into how you will be using your GPS unit. Let’s just start off with the Rolls Royce of motorcycle GPS units. The Zumo 595LM has just about everything you could need. It’s got a large screen (12.6cm diagonal), which makes it easy to read at a glance. 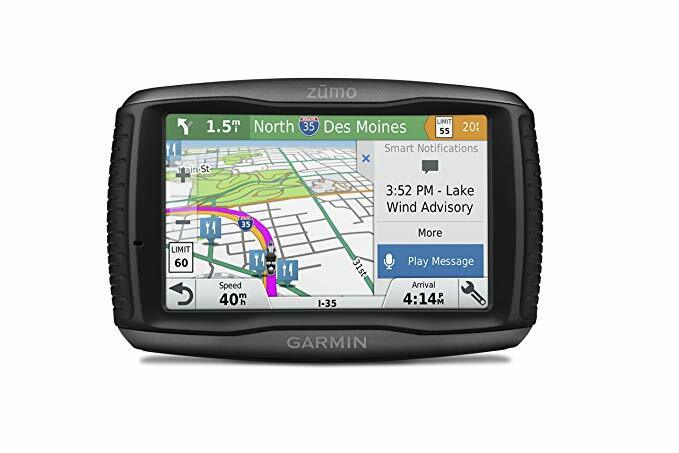 It’s a Garmin, and like most Garmins it comes with a plethora of maps and new ones become available or are updated all the time. The Garmin App also can pull traffic data from your phone and display it on the GPS unit. It even has a “route shaping” feature, which is really useful for planning. Lastly, the display is customisable to show the things you’re most interested in. Every product has its downsides though, the first of which is that the software can feel a little bloated. This affects riding in that there’s a number of warnings and popups need to be dealt with – annoying in a car, even more irritating on a bike. The unit is also rather expensive compared to other models, so if you’re trying to keep costs down, you’ll probably just need to strike this one from the list. 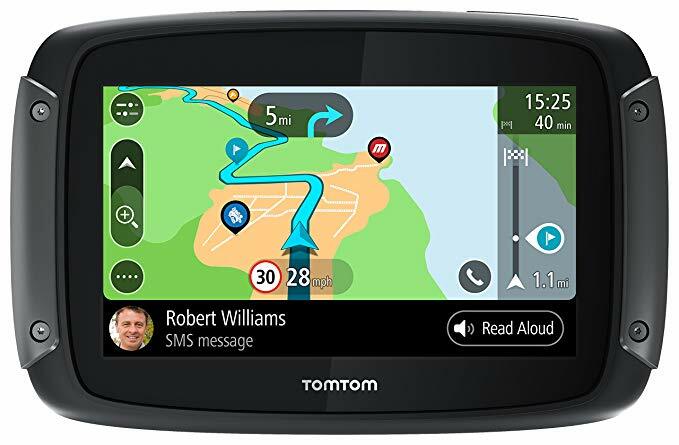 Garmin might be the inveterate powerhouse of navigation these days, but it was TomTom that truly paved the way. They were the first to popularise carrying a standalone motorcycle GPS unit, and as such, they have a lot of experience when it comes to making a product that functions smoothly. The Rider 550 is a well-oiled machine with a lot of functionality, and an even better user experience. Let’s start with a nice little thing about the screen: the 550 lets you indicate whether you’re wearing thick or thin gloves so it can maintain the right sensitivity to your touch. The screen is slightly smaller than the Garmin at 11cm diagonal, though. This unit was actually designed for use with a car, but it works equally well mounted on your bike. Plus, who wants to buy different units for all of their vehicles? If you desire the functionality of the Garmin 595LM, but aren’t willing to pay its high price, this could be a good option. This is a good unit for road/sport touring. The Nuvi 2699LMT’s 15cm screen is larger than either of the others on this list, making it easy to use so long as your adventures stick to the highways where you won’t be worrying about crushing the protruding screen as you tip the bike on a muddy trail. It also comes with access to Garmin’s extensive library of maps, which can be invaluable. The downsides to this device mostly have to do with it not being as easy to use as the 595LM. Menus are not as customisable and are simply more difficult to navigate. However, it is priced considerably lower, so it could be an option for general touring riders on a budget. The Montana 610 from Garmin is a fairly middle-of-the-road model that’s not too expensive while still having all the necessary features. This is the GPS of choice for many adventure riders. Its lithium-ion battery is slated to last for sixteen hours of solid use or twenty-two hours with AA batteries – considerably more than you’d get out of a smartphone. It also comes equippe with a barometric altimeter, which is useful for figuring out your elevation and predicting if a storm front is rolling in soon. Admittedly, the screen is a little smaller than either the Nuvi26999 or Zumi with only a 10cm diagonal length. It’s not a major difference though; it just means you’ll do a little more scrolling on the map to see all your waypoints. It also has four gigabytes of internal memory, which can be expanded with a microSD card – plenty of space to hold all your maps. It comes loaded with 250,000 maps from Geocaching.com too. 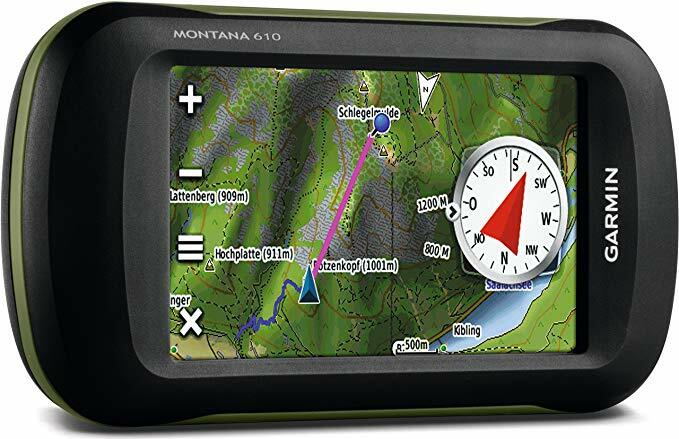 The Montana 610 also has an eight-megapixel camera, which can be really useful for geocaching or just making notes about the appearance of your waypoints. 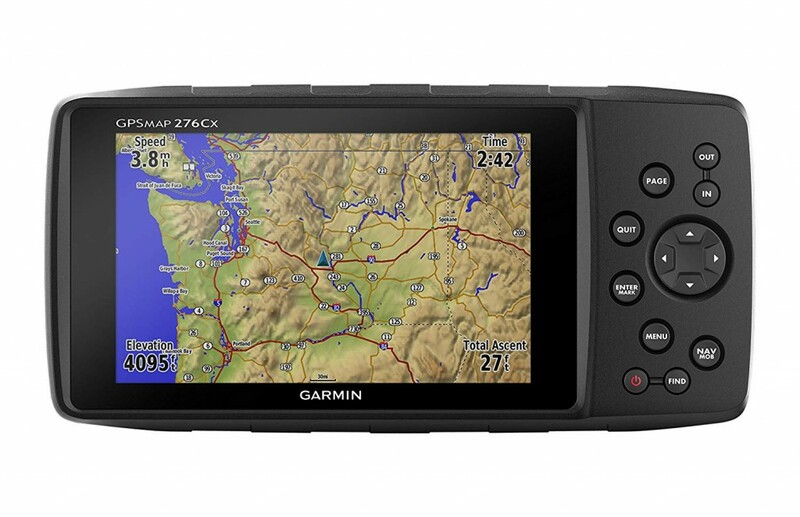 While most of the units on this list were designed for all kinds of outdoor activities, the GPSMAP 276Cx was created with adventurists like dual-sport motorcycle riders in mind. Its lithium-ion battery will last about sixteen hours and it can run for another eight hours on AA batteries. In terms of construction, it has the same IPX7 rating that most of the other units have. Where you’ll really notice a difference is with the screen, 13cm of diagonal length. This is the largest display of any of the GPS units we’ve reviewed. Unlike many of its competitors, it’s also not a touchscreen. While a non-touchscreen might seem outdated, it actually makes the unit a bit more rugged (more durable glass) and easier to operate when wearing gloves. 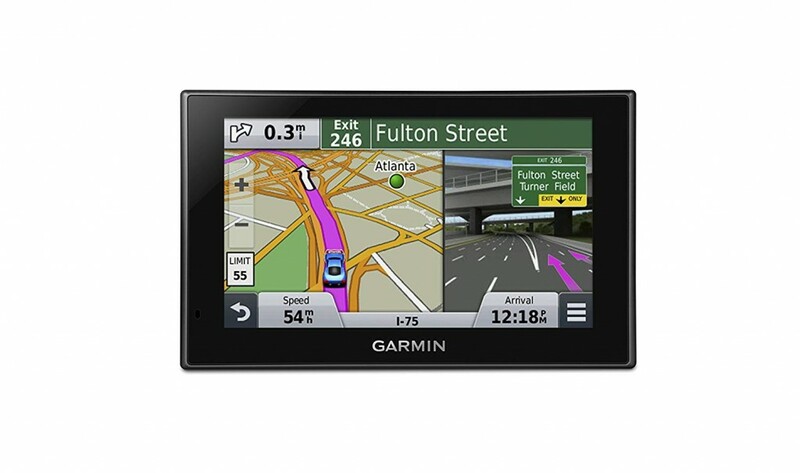 If you’re someone that’s new to stand-alone GPS units, the 64ST from Garmin might be one of the best choices for you. It’s easy to use, has most of the features that will be useful to you, and won’t cost an arm and a leg. The unit comes with a hefty 8 gigabytes of internal memory and the possibility for expansion with a microSD – plenty of space for downloading extra maps. However, its screen is the smallest of the units reviewed, at 6.5cm of diagonal length. Like the 276Cx it also does not have a touchscreen, which lets you keep your riding gloves on while operating it. The small screen limits its useful as a mounted navigational tool, but if you’re leaving it in your tank bag and only checking it occasionally, this isn’t a problem. Whether you’re riding gnarly track in the mountains or making a cross-country road trip, having a motorcycle GPS unit can prove very useful. Not only do they ensure you reach your destination, they can be helpful for planning (how many miles are you racking up each day?) and some models can even monitor important stats on your bike like tire pressure. Riders that mostly do general or adventure touring should focus on finding a unit that they are comfortable using and is easy to read while you’re going down the road. However, dual sport bikes would be better served by something durable and waterproof that for sure won’t die when you’re a hundred miles from civilisation. 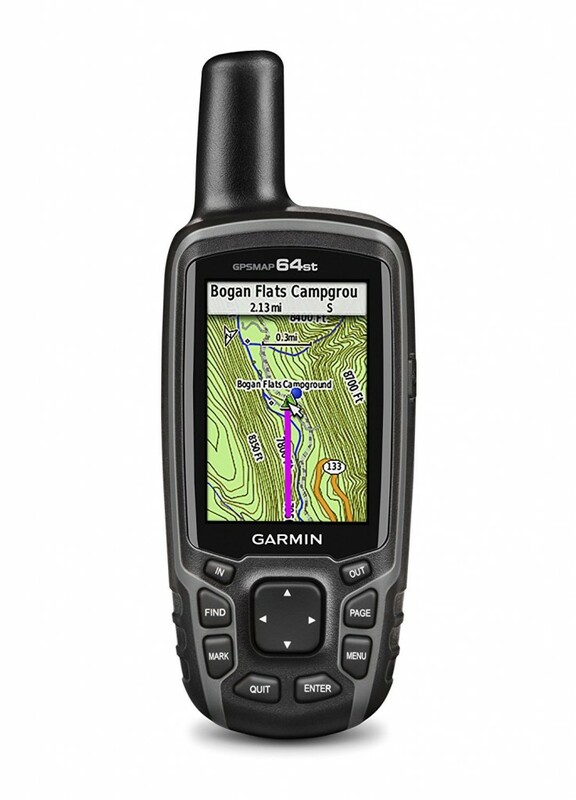 If I could only choose one for all purposes though, it’d probably be the Garmin Zumo 595LM. If you’re a rider on a budget though, and the Zumo’s price tag is scaring you off, the TomTom Rider 550 is half the cost and still an excellent product. On the other hand, if price is less of a concern, the large screen on the Garmin 276Cx makes it ideal for mounting and easy viewing.